Everyone needs to invest for his or her retirement and plan for the day that one's retirement gets here or otherwise invest for the creation of wealth. The issue is most Americans have not saved very much for emergencies, much less their retirement or wealth creation. Investing is not just an activity for the wealthy, but rather anyone who takes the time to understand what it is they need. 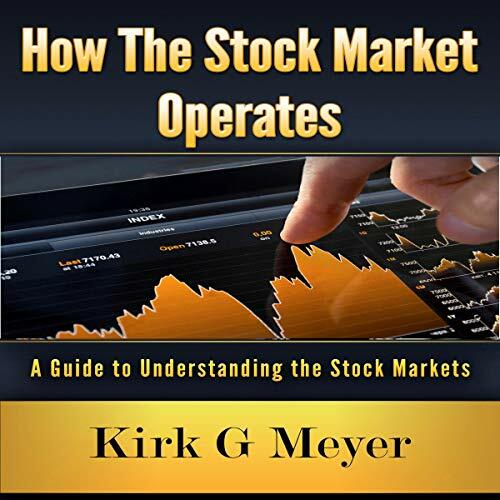 How the Stock Market Operates: A Guide to Understanding the Stock Markets is a comprehensive look at the basics of investing and how you can overcome any fears you may have about investments through the use of the stock market. Anyone can invest in the markets if they chose to, and how to do so is up to them as well. It is important that before anyone begins their investing career that they first understand the basics and what it takes to be a successful investor in the stock markets. This audiobook will lay out the basics of the stock markets and make it easy for you to join this world of being a proactive investor to aid and protect your financial future. Get on top of your investments and start down the path to a financial state of freedom by listening to How the Stock Market Operates: A Guide to Understanding the Stock Markets and buy your copy today. I received a free copy of this in exchange for an unbiased review. When it's all said and done I still don't get it. I think the book needed more examples for us lay people. How the Stock Market Operates: A Guide to Understanding the Stock Markets (Financial Markets, Book 1).. This book is packed full of tips and helpful advice. I only wish I'd had this advice 30 years ago. How the Stock Market Operates is a great introduction to the stock market. If you have never invested a dollar in the market but want to know why you might want to, how to start and some pitfalls to avoid you are in the right place. I am always slightly skeptical about books telling you how to invest your money, however the author does a great job of illustrating the risks and rewards of investing in stocks and bonds. He also helps raise red flags that can help you avoid potential scams. Kirk Meyer is able to explain concepts that can seem complicated and overwhelming step by step in clear English using helpful analogies some simple examples. Even if you are an experienced investor, this makes for a great review. Lisa Ware does an excellent job narrating the text in a friendly, helpful manner. She is pleasant to listen to – even when explaining terms that could be considered dry or a little abstract. It’s short but packs a lot of information in an easy to digest book.